This is a Wealth-Lab static and fundamental provider for free intraday and daily data for U.S. stocks and Forex by AlphaVantage. The EOD data spans 20 years while the intraday data is limited depending on bar scale (1-minute: 1 week, 5-minute: 4 weeks, 15-, 30-minute: 6 weeks, 60-minute: less than 3 months for stocks and less than a month for Forex). the split and dividend history for U.S. stocks is stored locally and can be optionally applied to price data. This means that DataSet refreshes are never required in order to apply the most-recent split and dividend data. Chart Annotations: "Split (AlphaVantage)" and "Dividend (AlphaVantage)". Support for GetSessionOpen, Strategy Monitor and Market Manager. Forex symbols must have FFF/TTT format, where FFF stands for From-Symbol and TTT stands for To-Symbol, for example: EUR/USD, USD/CHF etc. The fundamental provider may return split-adjusted dividends for a chart's dividend popup as well as when accessing the "Dividend (Alphavantage)" fundamental item in Strategy code. While the dividend adjustment factor maintains proper percentage relationships between prices, it's possible that new dividends affect previous backtest results (trades) for some strategies. 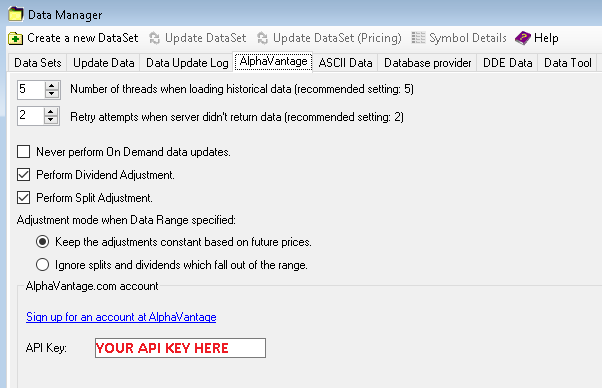 Disable "Apply dividends" in the Backtest Settings Preferences when using dividend-adjusted data for backtesting. If you don't, the dividend effect might be duplicated in the Performance results, especially for the Buy & Hold Strategy. When editing data, be aware of the Perform Dividend Adjustment selection since the chart values will reflect this adjustment. Deselect this option and refresh the chart to edit raw price and volume. Under investigation: When Market Manager support is enabled, the bars on some timeframes may be incorrectly filtered out. Workaround: disable AlphaVantage provider in the MM. Forex data itself has issues currently: flatline weekend bars in the intraday data, weekend bars and crippled bars in the EOD data. Cryptocurrency data is not supported, and its support is not planned. Use Cryptocurrency (Bitcoin) data provider instead. Check out the feed's website for usage quota/limitations on the free tier (e.g. 5 requests per minute) or premium plans.